With our SEO research to understand more about what Google is doing with algorithm changes we follow specific websites and monitor the changes of websites to understand the effects things are having. Understanding what Google is doing and what Google needs is vital to Search Engine Optimisation and as one of leading providers of SEO in the UK we monitor and track many high profile websites in varied sectors. 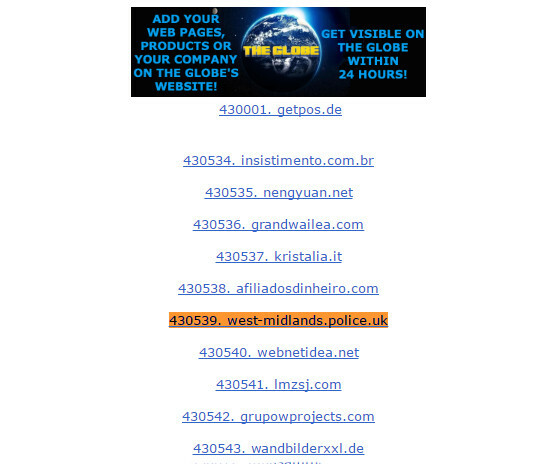 The website URL for the West Midlands Police is www.west-midlands.police.uk and this has a backlinking profile that attracts links on a regular basis hitting peaks of 3000 per day at times and this profile has been growing since March 2011. 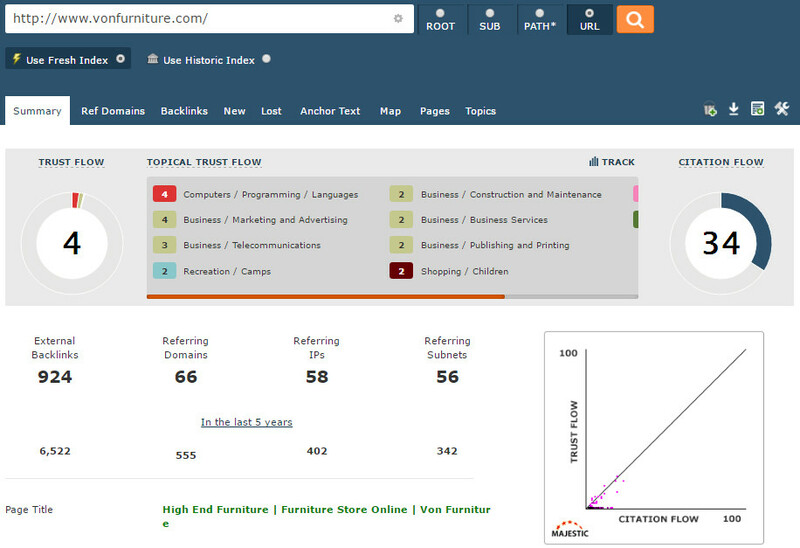 The overall result of the backlink profile is giving a trust flow of 50 and a citation flow of 42. The trust flow is a score based on quality, on a scale between 0 and 100. Sites closely linked to a trusted seed website achieve higher scores and websites that may have some questionable links have a lower score. The Citation Flow is a also a score between 0 and 100 and this is a measure of link equity or “power” the website or link carries. 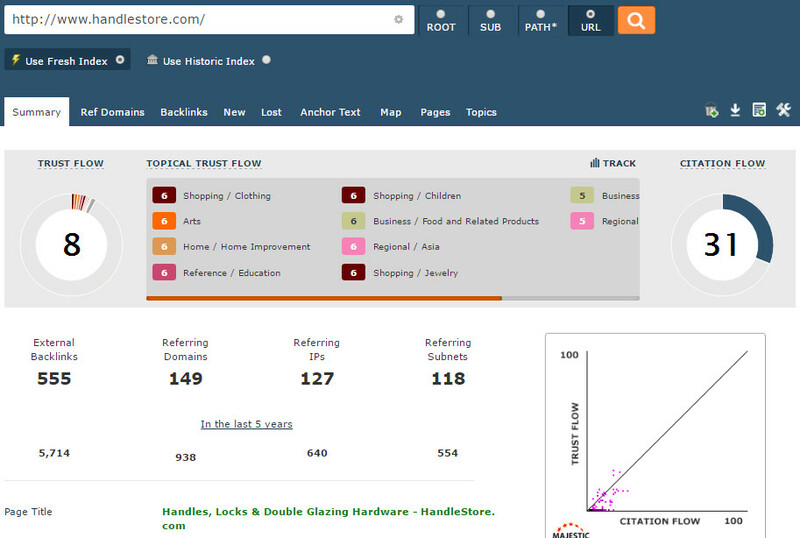 Citation flow is used in conjunction with “Trust Flow” to understand the cleanliness, quality and power of a websites profile. 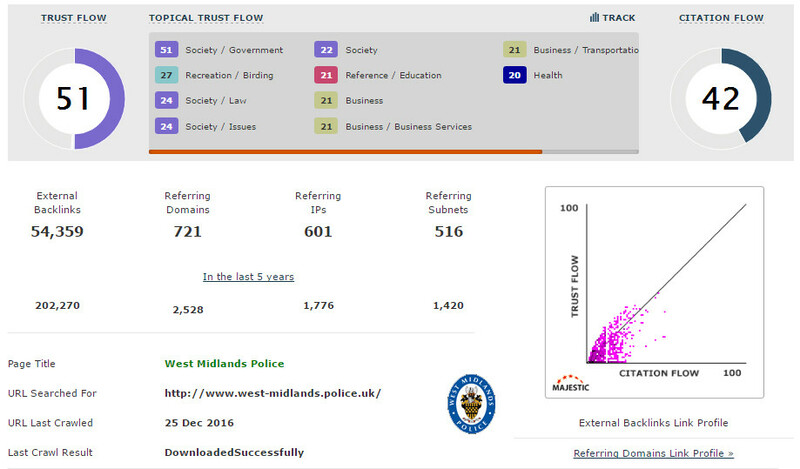 This score for the West Midlands Police Website is generated from 54,359 backlinks in the last 90 days and in the last 5 years the website has attracted 202,270 backlinks. It is important to look at what domains are linking to the website and these are referenced as referring domains, which in Google’s view are passing votes to the content on the website. The higher the profile of websites linking to content the better the content must be and also it must be important so Google take this content vary seriously. A website with no backlink’s has no authority on the subject matter. 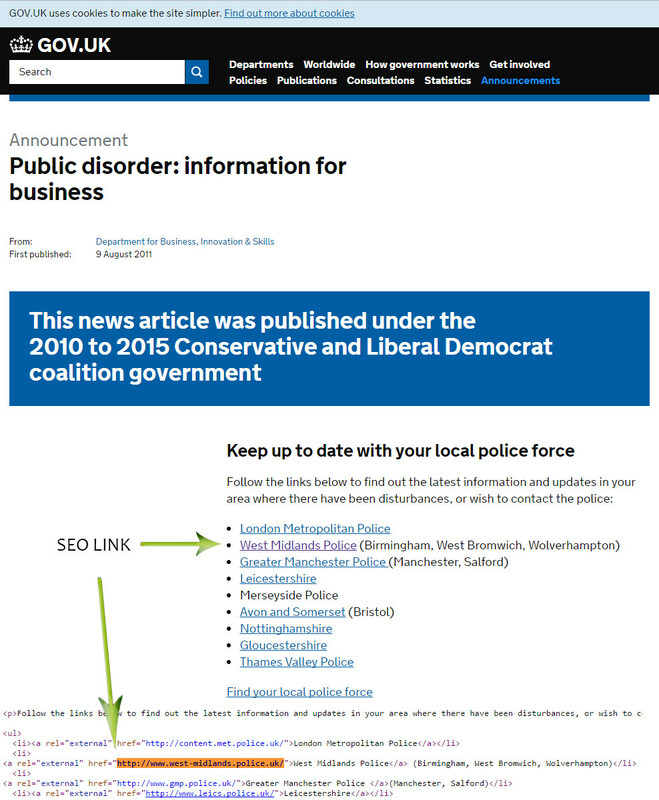 The Police are always attracting links from websites and as an example the company Handlestore Ltd with the domain URL http://www.handlestore.com/ links to the police on their Google Plus page when they discuss security improvements. 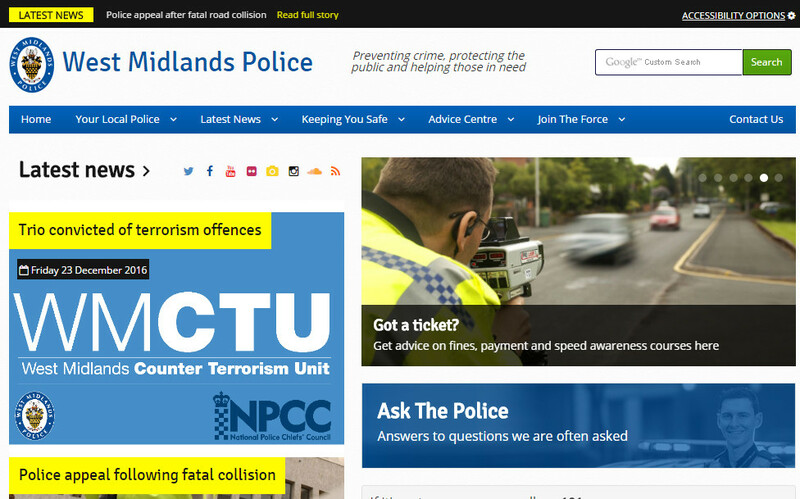 This is used in an attempt to show they are helping visitors by linking to authority websites. This is not so important to Google due to the fact it will actually tell Google to check out other websites for better content. 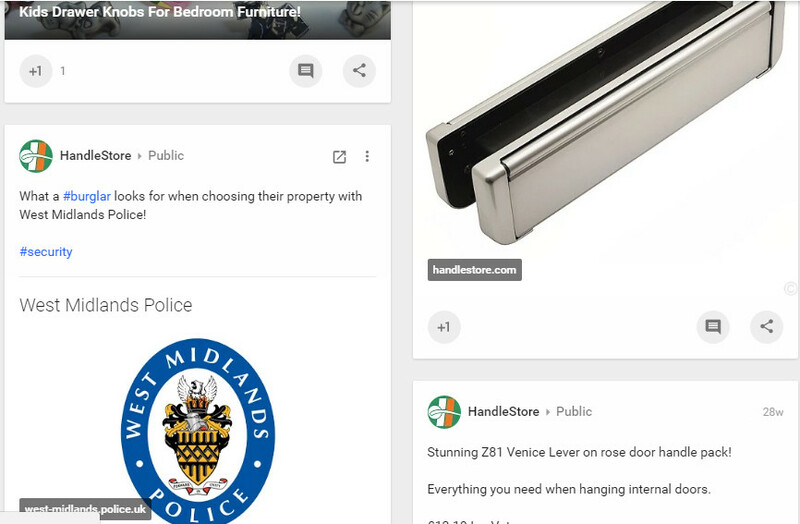 This Google plus profile is the same as blog post and the company is promoting their website products and then linking to their own website and also trusted URL’s such as the West Midlands Police in order to grow the SEO backlink profile. Google will not really care much about this however and unless this is adding value to visitors the Google plus page itself adds no real value at all to the ranking of the main website URL. Google’s guidelines explain that they do not want to find paid for links and link farms. The reason for this is that it adds zero value to Internet users and makes Google’s job much larger. Websites that provide links in this manner are adding pollution to the Internet and add no value to a business owner or visitor. 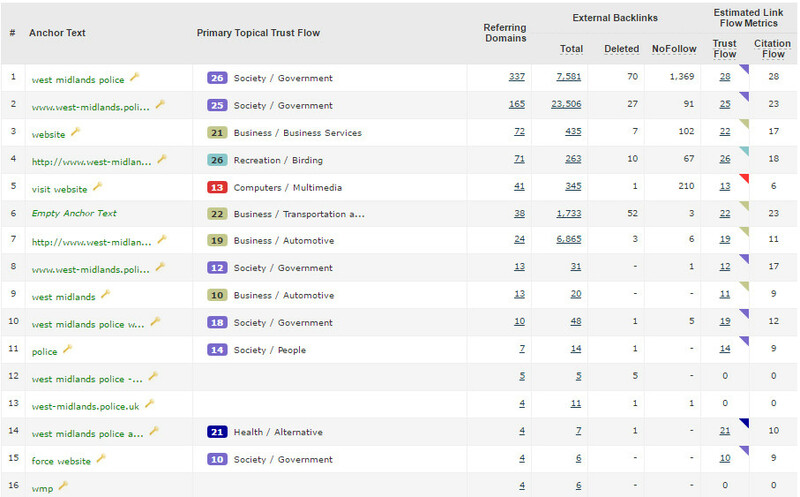 This website has a TRUST problem and anyone with links on this website is more likely to have a decreased overall ranking position due to this for any keywords used. The problem for this website is that the website itself has lots of poor quality linking to it. 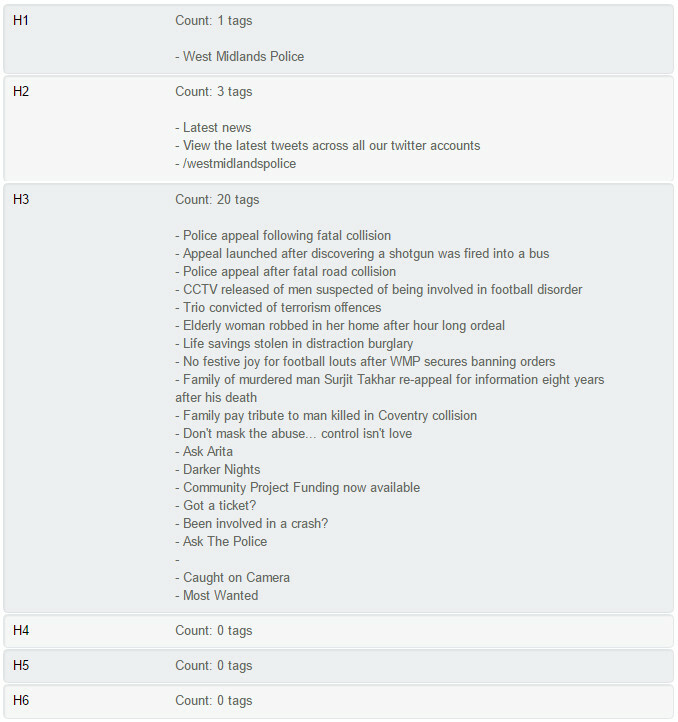 This information here which has led us from the West Midlands Police Website to a furniture linking website shows how random the Internet is and what Google finds is often completely odd and random. It is for this reason that we have added this information in this article. All these links are picked up by Google and used to create a power profile which in return will provide an idea of trust. 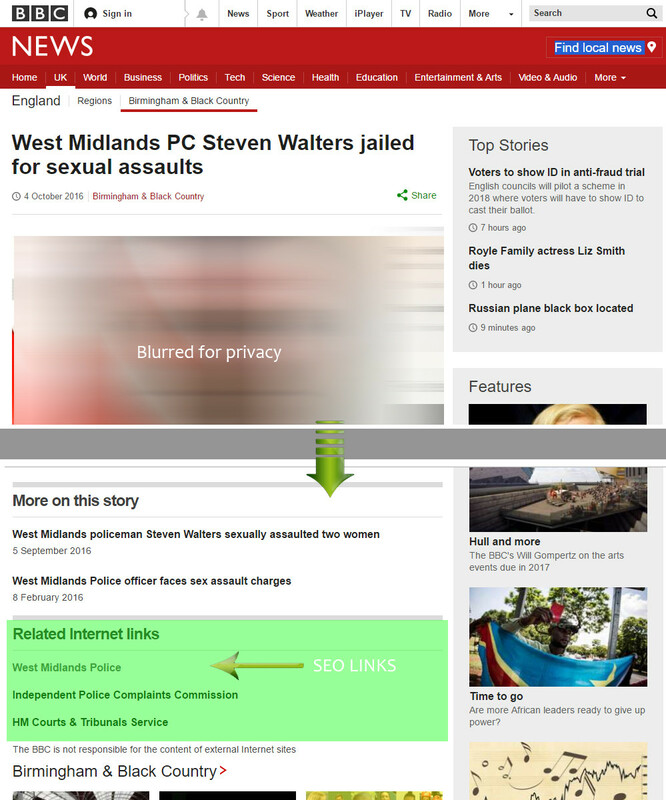 Due to the BBC and Government websites not selling links and being quality content with high profile websites linking to them also, these are some of the best links available on the Internet and this adds huge value to the West Midlands Police Website. 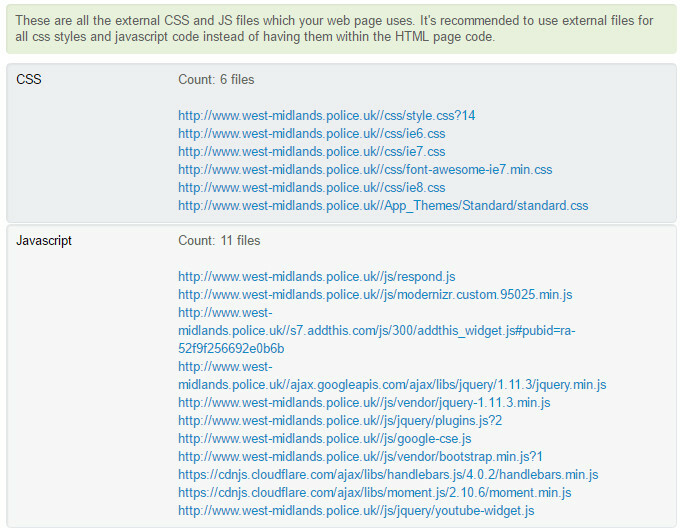 This is an un-trusted site and this is an example of a negative link pointing at the West Midlands Police website. It is also important for Google to look at where the links are coming from in relation to location. The country the links are generated from pay an important part of SEO. The result of the content and the backlinking profile Google finds will then allow content to be shown in the search results. 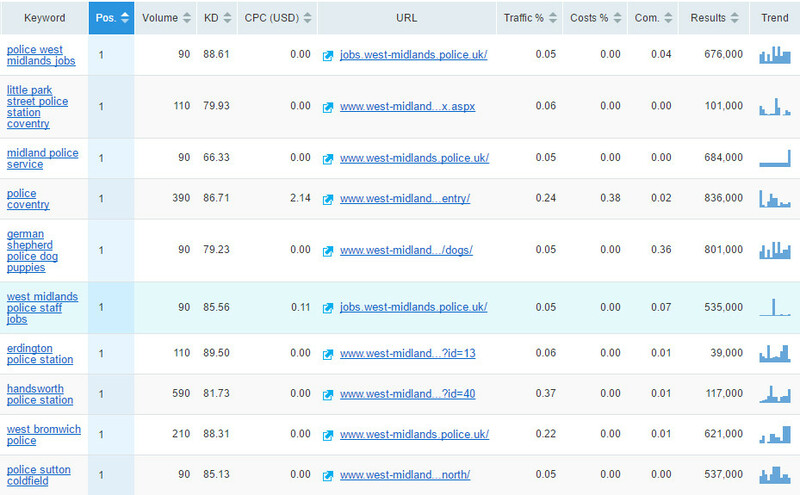 http://www.west-midlands.police.uk/ keyword ranking data spreadsheet. 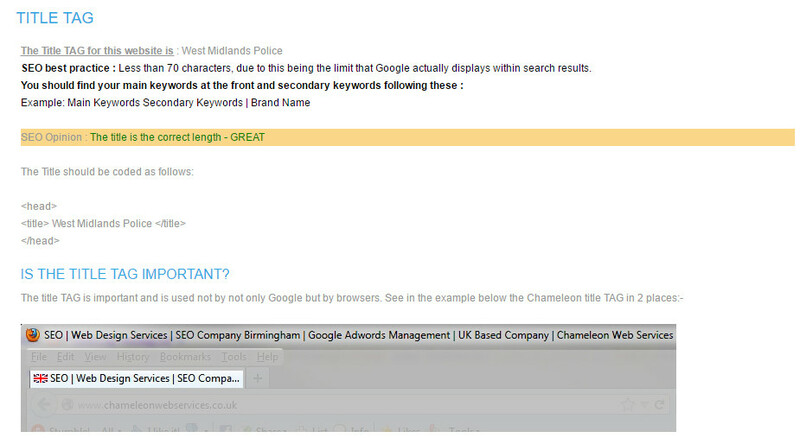 In this example Google ranks the West Midlands Police Website number one in the search results. 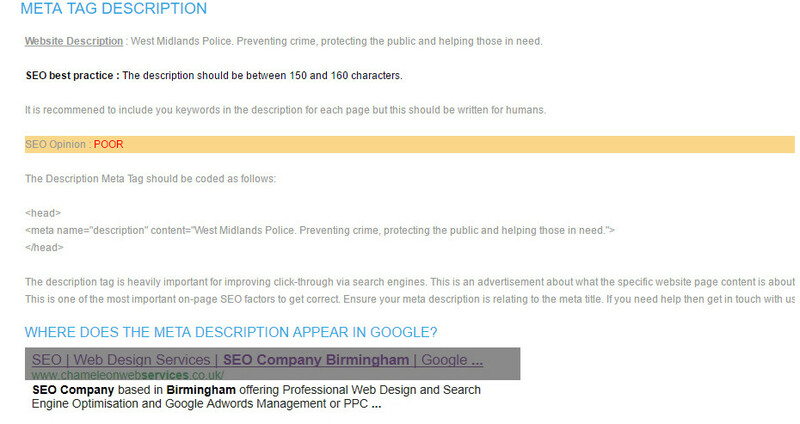 The content on the website is the most relevant to this search terms but due to the content structure the WM Jobs website is actually providing Google extra information in snippets and this is shown in today’s algorithm above the number one search result which is known as Google’s Quick Answer box. 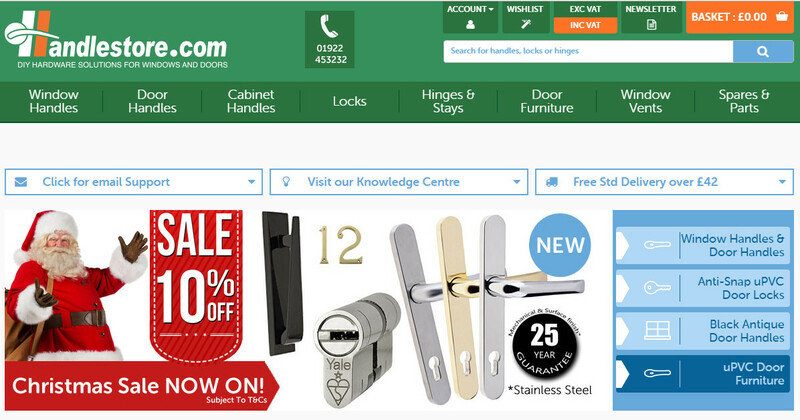 This example shows how important SEO services are to a website. 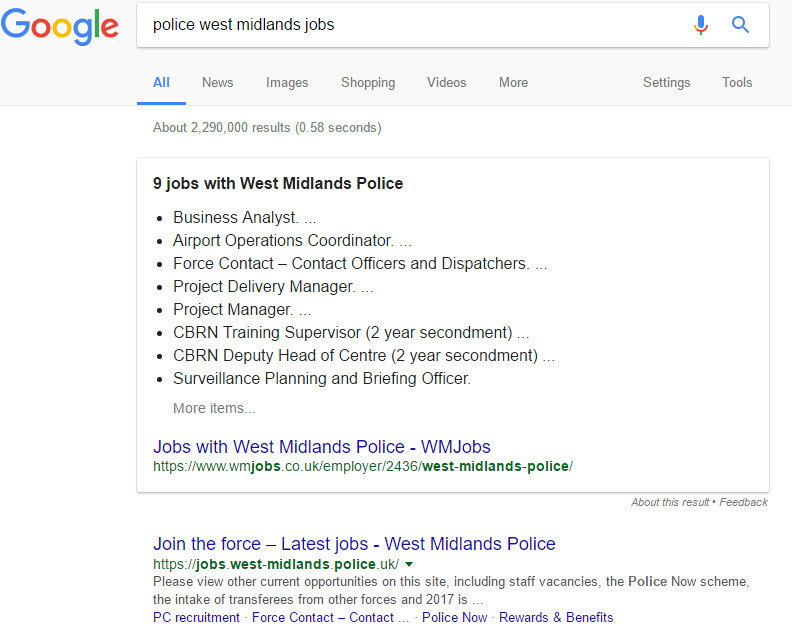 Even thou the West Midlands Police website is most relevant due to the content not being fully optimised and setup for the latest Google algorithm they actually loose traffic to the WM Jobs site. To understand more about these pages we need to look at the data Google needs to find such as the title and meta description so that Google understands what the pages are about. It is important to look at how How does Google Search works to understand more about what we need to provide Google in-order to rank well. You can see that Google is adding the site name to the title automatically. Also in the top 3 of the Google search results is Indeed. 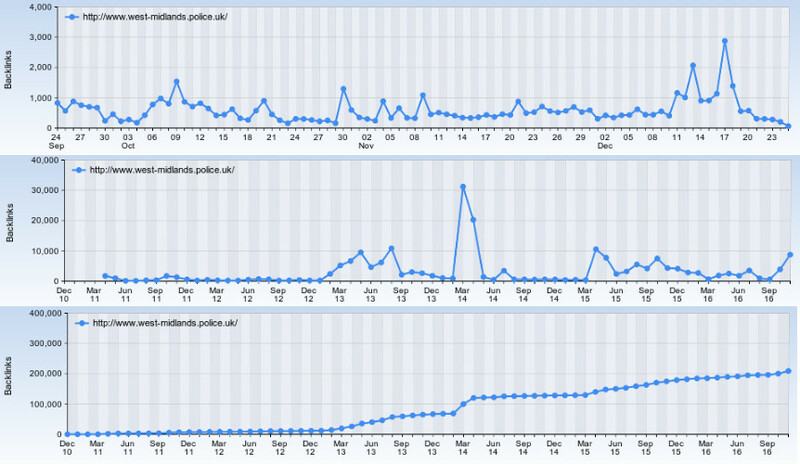 It is clear that Google uses data and is manipulating the data it finds. 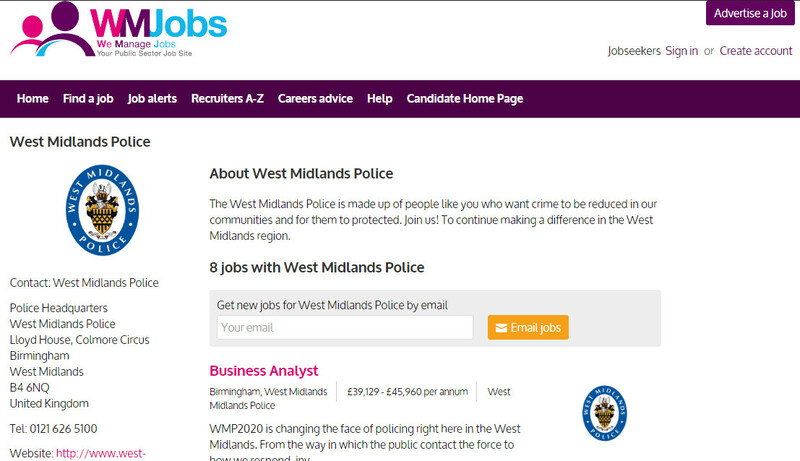 West Midlands Police does not have any description or keywords. Instead the website includes data known as Open Graph Tags which are used by Facebook. OG data promotes integration between Facebook and websites by creating objects with the same functionality as other Facebook objects. WM Jobs does not use meta keywords. It is important to note that Google doesn’t use Meta Keywords since around 2009 but these are still used by other search engines such as Bing. Using H1, H2 and H3 headings are so important for on page SEO as this tells Google what the content is about on the pages. The ordering of H1 should follow a natural path. The H1 heading is at the top of the page and then H2 to break up content and then H3 inside the H2 content where needed. Google uses this data and the algorithm is clever enough to work out the content on the page with the use of H1, H2, H3, etc heading tags. The algorithm has also worked out that some websites mess up the ordering or try to manipulate the content and this should be avoided. The content on the page is then grabbed and this should be reflected in the above Titles, Meta data and headings. If Google finds unique content it doesn’t really care how pretty the page looks it will now want to use this content within search results and the ranking positions within search results is now down to the quality of the content and the information that has been provided + whether or not Google trusts the content. A highly skilled SEO consultant can look at differences between websites and understand what is required to be competitive on page one of Google search results looking at the current websites already there. SEO Is Vital To Online Success?